After touring the San Juan Islands by bicycle during law school nearly 30 years ago, Conni had always wanted to go back and spend a bit more time exploring the island group, so after leaving Victoria, BC behind, we enjoyed several days of cruising in this gorgeous area. After clearing customs in Friday Harbor on San Juan Island, we lingered in Friday Harbor for a couple of days. 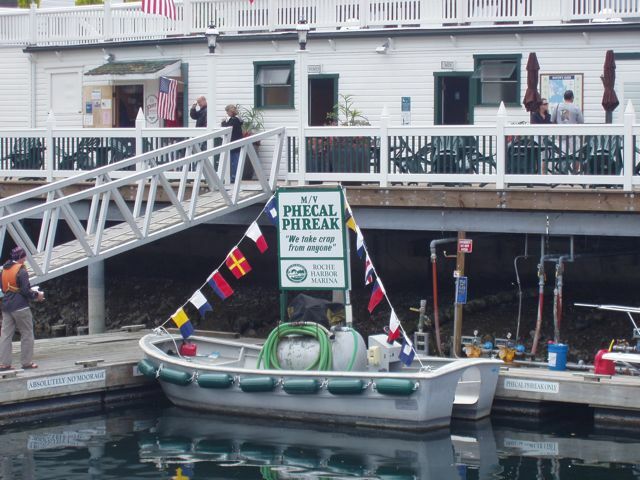 Friday Harbor is the county seat of San Juan County and has a bit more bustle to it than other island towns. 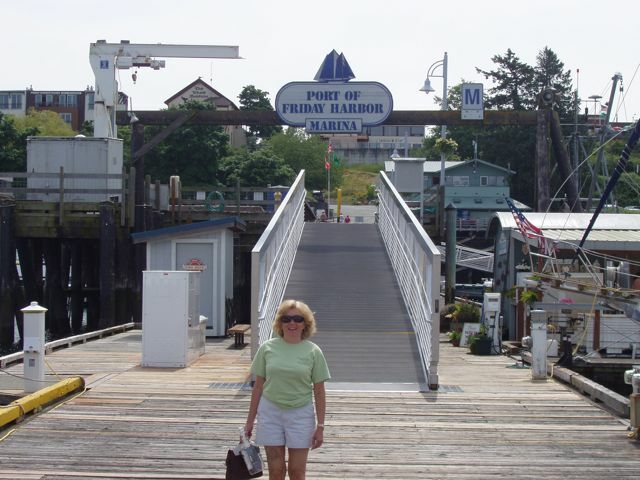 We also spent a couple days in lovely Roche Harbor on San Juan Island, stopped back at Orcas on Orcas Island so Bill could pick up a package at the post office, anchored off Shaw Island and visited Janet and Lee Wheeler on Decatur Island. Janet is the lifelong friend of our close friend Holly McLean, who has arranged the visit. Janet and her husband Lee very kindly met us at their community dock on Decatur, gave us a great tour of their remote island community and treated us to wine and smoked Homer, Alaska (!) halibut on their deck. It was easy to see why many cruisers spend an entire summer in the San Juans. 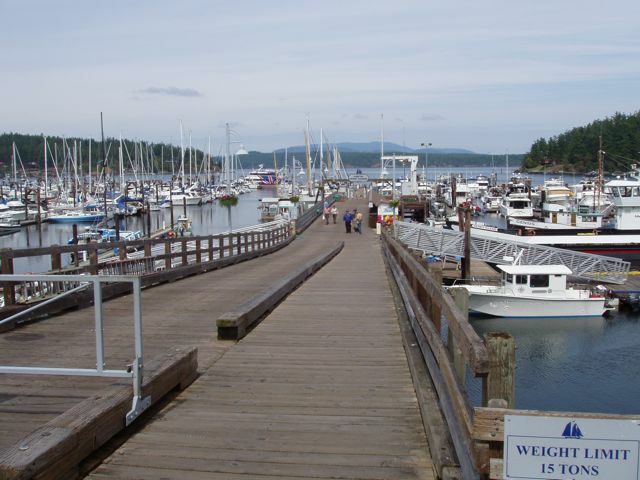 The main pier at Friday Harbor offers a great view of this pretty marina. After checking back into the USA through Customs, we moored here for two days at our reciprocal yacht club, the San Juan Island Yacht Club. I traded them the burgees (flags) of our two yacht clubs, the William H. Seward Yacht Club and the Kenai Fjords Yacht Club, for two of theirs. Yacht clubs love to display the burgees of visiting clubs. 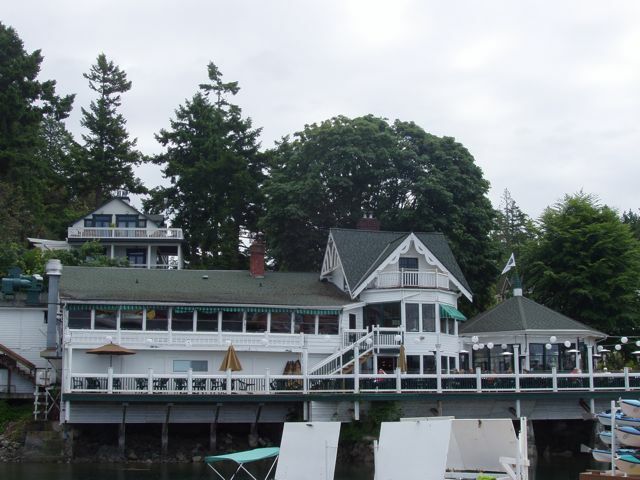 Roche Harbor, famous for its historic resort. This was formerly the home of the McMillin family which operated lime kilns here. This really needs no explanation, does it? 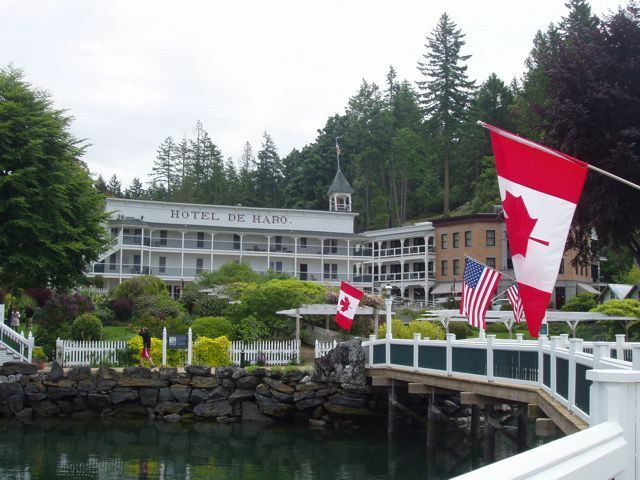 The picturesque Hotel de Haro at the resort, named for Captain de Haro, the first European to sail the San Juan Islands. The hotel's gardens, while nowhere near as extensive as the Butchart Gardens in Victoria, are nonetheless exceptionally pretty. No surprise, the madam of the estate here was a good friend of Jenny Butchart. 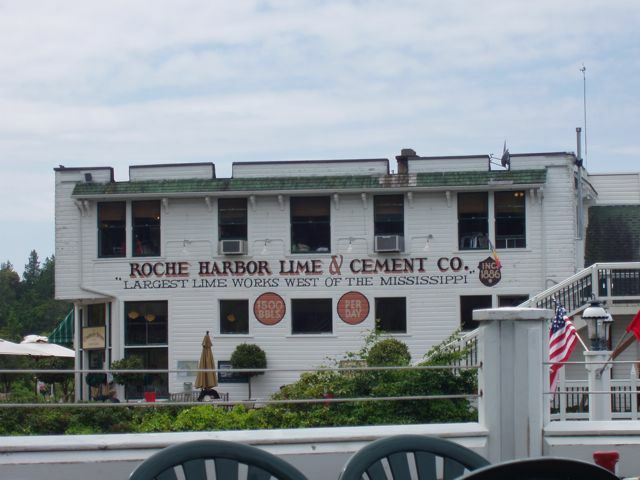 Now a set of shops and restaurants, this was originally part of the lime processing facilities at Roche Harbor. 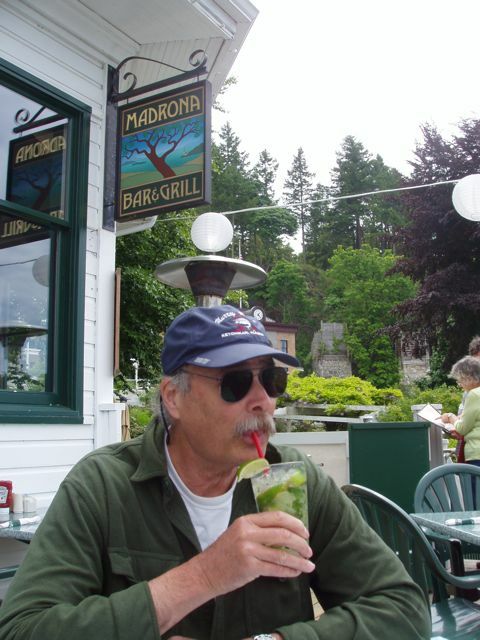 Bill enjoying a fine mojito on the deck of the famous Madrona Bar & Grill at Roche Harbor. 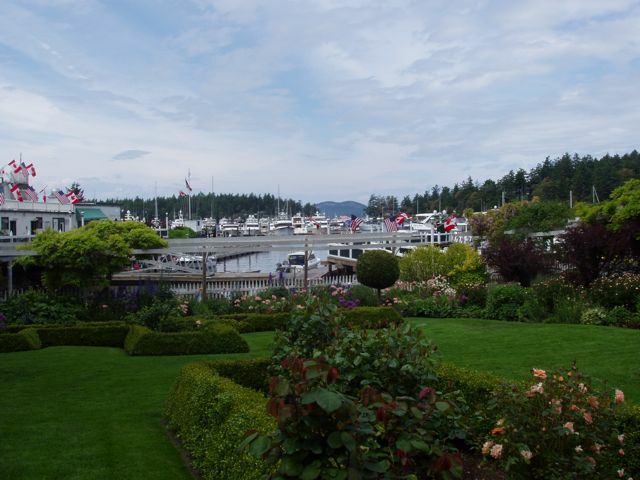 The view from the gardens back toward the marina at Roche Harbor. 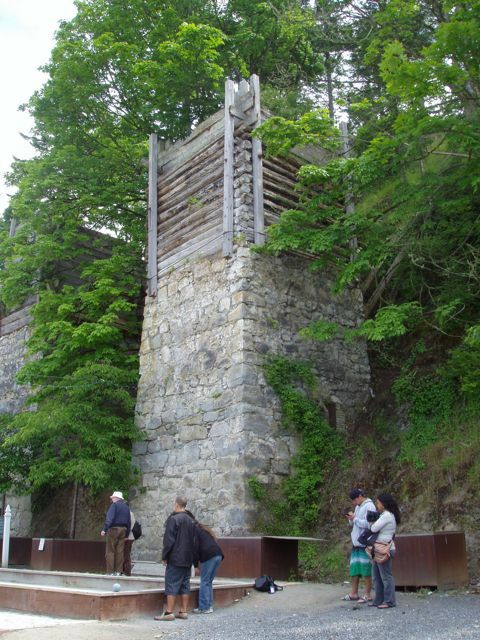 One of the original lime kilns at Roche Harbor. Many of the nearby islands were completely denuded of trees for wood for the kilns when the lime plant was in operation. 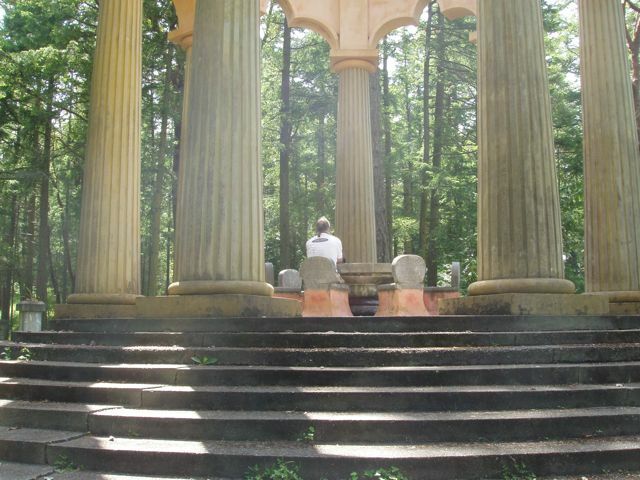 John McMillin, founder of Roche Harbor, built a beautiful mausoleum for his immediate family. Each member's ashes are interred in the base of a chair around a circular table. 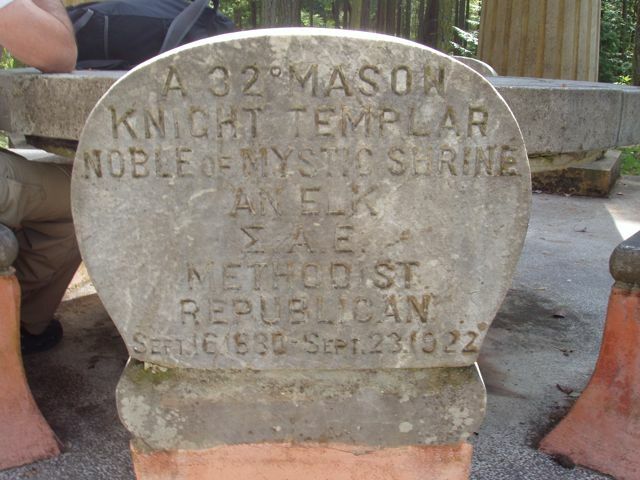 Bill thinks Mr. McMillin, as a 32nd degree Mason and Knight Templar, probably knew where "The National Treasure" is hidden. 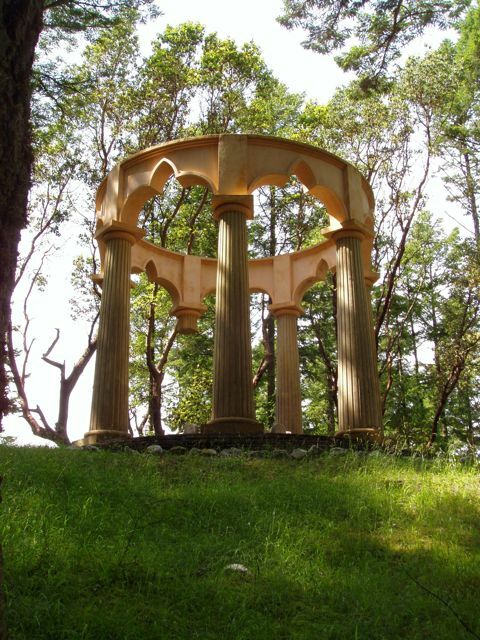 The mausoleum is situated on high ground in the forest overlooking Roche Harbor. Bill sits in one of the chairs contemplating something or other. The mausoleum has seven pillars, one of which Mr. McMillin left incomplete to symbolize that man's life's work is never done. The structure has many elements of Greek and Masonic symbolism, and truly is a pretty and serene place. 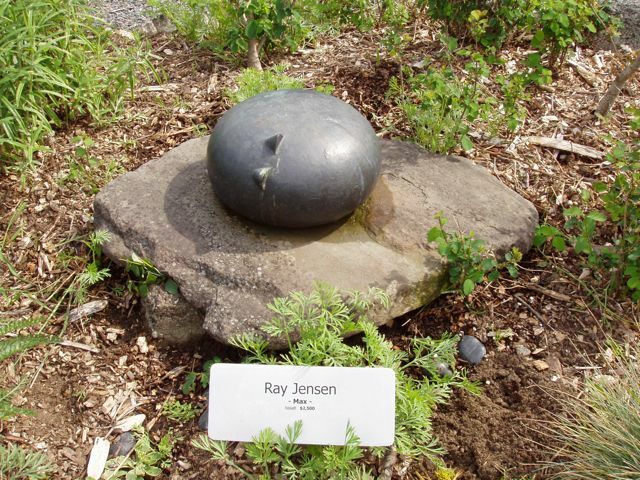 Roche Harbor also has an extensive outdoor sculpture garden that features the works of many San Juan Island artists. 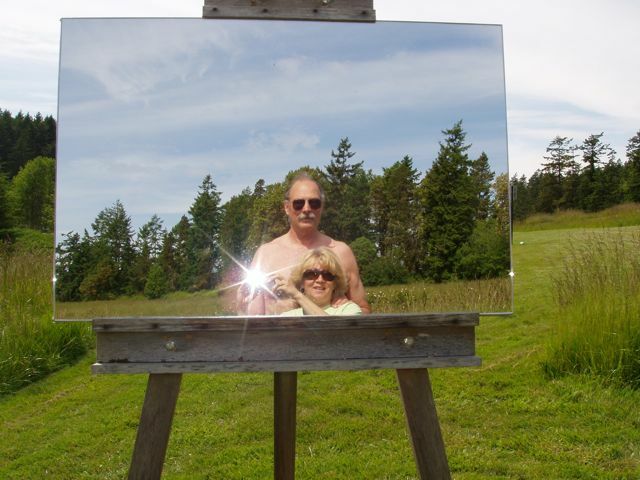 Here, a clever mirror allows the viewer to be a part of the art. I couldn't resist capturing the image. Anyone who has ever owned a cat will immediately recognize the inspiration for this piece. 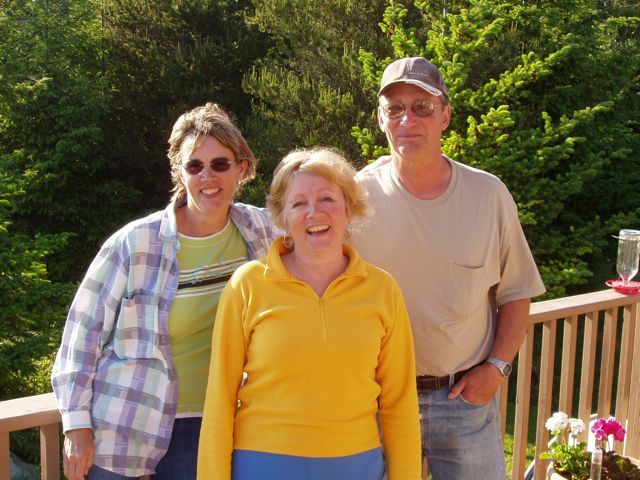 Conni with Janet and Lee Wheeler, whose lovely home on Decatur Island we visited. Decatur is one of the San Juan Islands that is not served by ferry, so it has a much more rural feel than Orcas, Lopez or San Jan Island. After leaving Janet and Lee, we motored through Deception Pass, which separates Whidbey Island and Fidalgo Island in the San Juans. 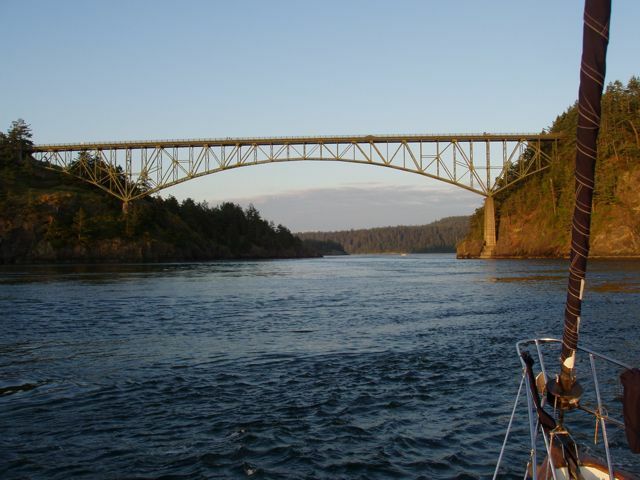 The Deception Pass Bridge is a famous spot, and the Pass itself is notorious for its tide rips and swirls. The tidal current is so strong through this narrow pass that one goes through with the tide or not at all.